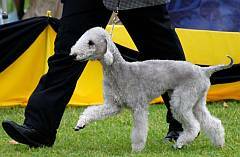 The Bedlington terrier is named after the town of Bedlington, in Northumberland, England. Miners used the dogs down the mines to catch rats and small animals. The miners also used the dogs to fetch things. Above ground the Bedlington terriers were used to hunt foxes, hares and badgers. Bedlingtons are friendly lively dogs. They make good pets and can be kept indoors or out. They love going for walks and running at top speed. Although they look like little lambs, they can get into fights with other dogs and chase small animals like cats. If puppies are brought up with a cat, they will be friends. A puppy socialisation class and training from an early age will help. A terrier is a dog that likes to dig, so make sure he doesn't dig under the fence! They were bred to dig small animals out of burrows. The head is pear-shaped. The hair should be clipped short on the head to show the shape. Eyes almond shaped & deep set. Back is arched. Tail low-set. The ears should be shaved, leaving a tassel on the tip. Regular grooming is needed. The dogs don't shed hair and are considered good for allergy-sufferers. Colour: Colors come in blue, sandy, liver, blue and tan, sandy and tan, and liver and tan. Tan markings may appear over the eyes, on the chest, legs and rear. 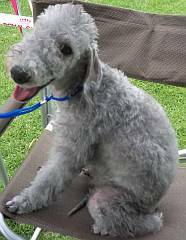 As a rule, small dogs live longer than big dogs, so a Bedlington might live 17 years. Bedlington puppies look like little lambs. They should be fed often with good quality puppy food. I recall that Jesus said his followers must, "Feed my lambs," meaning make sure folk are nurtured in the faith so they grow up strong.